Our week-long Summer Rock Camps are open to students ages 6-17 from first-time beginners to advanced musicians. Students learn how to play rock cover songs in a real band, write and record their own original songs, and much more (camp details here). Each Summer Rock Camp ends with a real rock show on Friday evening at a local venue where students perform what they learned. You will be amazed what these students can accomplish in one week! Each month during the summer we will be offering our week-long Summer Rock Camp. The regular price for Camp is $400 per camper so sign up now to save $60. To take advantage of this special you must submit a non-refundable $50 deposit that will be applied to camp tuition to reserve your space in camp. In addition, we offer family and sibling discounts! The regular price for Camp is $400 per camper so sign up now to save $75. To take advantage of this special you much submit a non-refundable $50 deposit that will be applied to camp tuition to reserve your space in camp. In addition, we offer family and sibling discounts! Anniversary Sale - Save 25% On Summer Camp & All Gear! Celebrate our three wonderful years of rocking Salem! 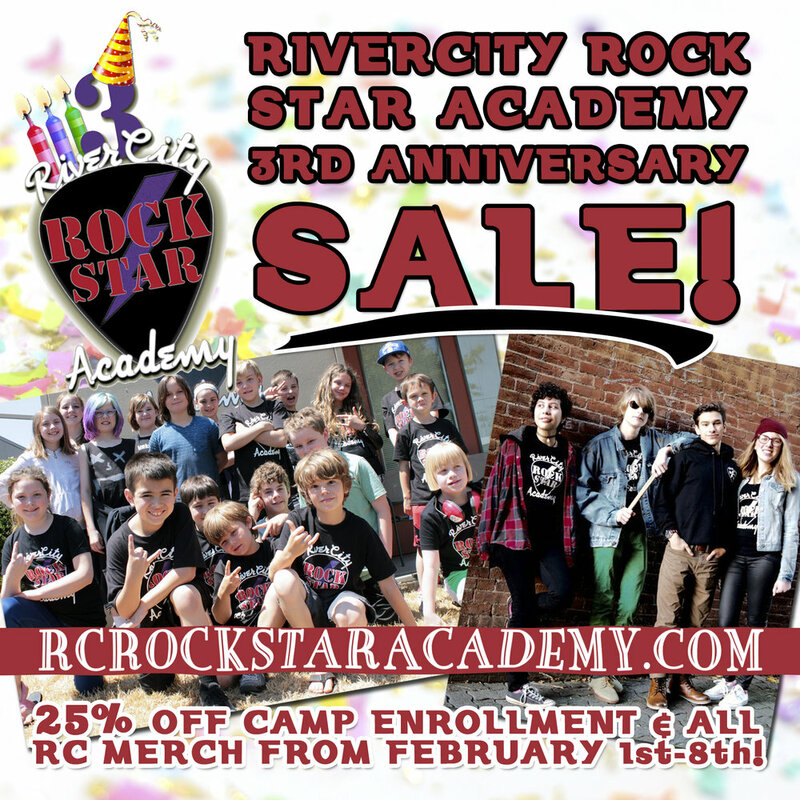 Save 25% on all Summer Rock Camps Save 25% on all RiverCity Merchandise. Offer ends February 8th! The regular price for Camp is $400 per camper. With our Anniversary Sale Special of 25% off, you save $100. To take advantage of this special you much submit a non-refundable $50 deposit that will be applied to camp tuition before February 9th. In addition, we offer family and sibling discounts!